A previously unpublished fairy tale by Mark Twain has arrived in bookstores. The fairy tale, The Purloining of Prince Oleomargarine, was built around an unfinished work by the famous writer. Twain invented the tale for his daughters in a hotel in Paris in 1879. Philip and Erin Stead, winners of the Caldecott Medal for A Sick Day for Amos McGee, helped complete the unfinished Twain tale. They used some rough notes about the story Twain had written down. The notes were found at the Mark Twain archive at the University of California at Berkeley. Philip Stead uses Twain's fragmentary script and story as a guide to complete the work. His wife - Illustrator Erin Stead - helped with the story and provided the artwork. Philip Stead told Publishers Weekly, "Though Erin and I both felt we weren't qualified to pull this off, we knew we had to say yes. We knew almost immediately what the ending was, and spent the majority of our time figuring out the beginning-and figuring out who these characters are and why we care about them. We knew we had to make sure we got that right-and that's what kept us up at night." The fairy tale follows Johnny, a poor boy with only a pet chicken. Johnny's fortune changes when he meets a kind woman who gives him some magical seeds that enable him to speak with animals. He sets out with his animal friends on a quest to rescue a stolen prince and faces a bullying tyrant king. 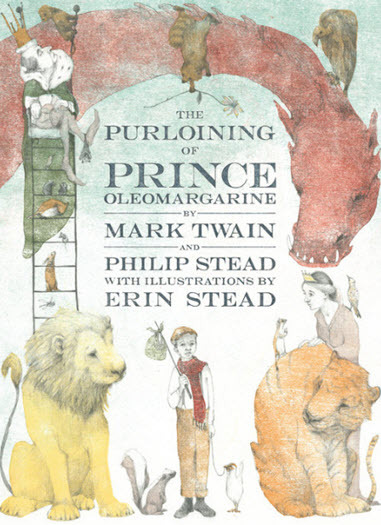 The Purloining of Prince Oleomargarine has received starred reviews from Booklist, Kirkus and Publishers Weekly. The new children's book is available for purchase from Amazon.com and other booksellers.